An fascinating fictional plan of Jerusalem. 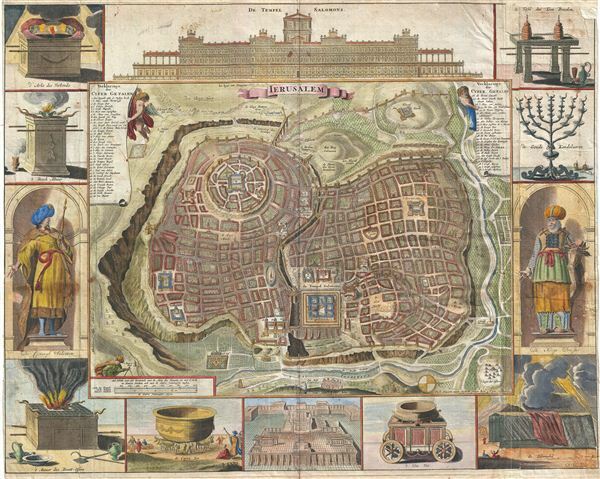 A remarkable imaginary 1702 plan of Jerusalem drawn by Daniel Stoopendaal but based upon an early work by Juan Bautista Villalpando. Villalpando's popular fictive view of Jerusalem first appeared in a 1604 commentary on Ezekiel co-written by Villalpando and Hieronymus Prado. The plan, which is oriented to the west, is based upon the Book of Ezekiel and writings of the first century Jewish historian Flavius Josephus, among other sources. Principle elements include the Temple of Solomon, bottom center, the City of David, upper left, and the historic city wall. The structure of Solomon's Temple, including the nine square courtyards, are based on Villalpando's interpretation of Ezekiel's prophecy of a Third Holy Temple. The entire map is surrounded by twelve vignettes relating to the Temple of Solomon, these include a view of the temple itself, the Arc of the Covenant, an altar, a menorah, a statue of Solomon, the Tabernacle, and an altar of burnt offerings. Biblia,dat is De gantsche H. Schrufture, Pieter and Jacob Keur, 1702. Good condition. Original folds. Older repair, upper right quadrant. Verso reinforcement, left side. Platemark visible. Text on verso. Laor, E., Maps of the Holy Land: Cartobibliography of Printed Maps, 1475 - 1900, 1150.